Working Pictures: FOUNDRY & MACHINE CO.
Great photo of the American industrial past. Thanks for posting it. The Naugatuck River Valley was a thriving industrial area all the way back in the day of direct water power. The river in its deep valley was ideally suited to deriving factory power from spill-gates and tunnels with turbines and other relatively simple techniques. The towns became centers of metalworking, especially brass and copper, along with foundries like this big one from the Farrel company. The prosperity kept dropping as new power sources came to the fore and ended the advantage of siting on an ideal river for water power. That's a very striking set of shapes, colors and surface textures. But elsewhere the same sort of elegant but outmoded industrial sites have morphed into fancy malls and apartments (e.g. in Burlington VT or Lawrence and Lowell, MA). Road access is usually good, and there is newer industry near for jobs. Is this happening in CT? Scott, 25 years ago there was a bit of revival as towns on the west side of the Naugatuck valley became part of the corporate "Connecticut Woods" with a number of large office campuses moving in. But no actual manufacturing came with it, and the corporate HQ boom was just a bubble. There are empty office complexes, and empty car dealerships, etc, throughout the area. Also lots of yuppie mansions for sale with no takers. Unfortunately there are far too many sites like this all throughout Connecticut. 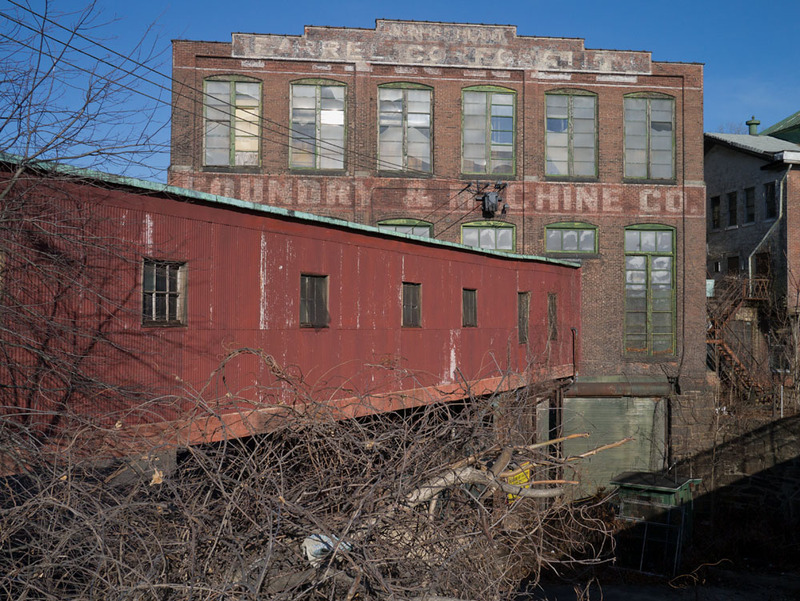 Some old manufacturing sites in the Norwich, Willimantic areas have be repurposed, but there are a lot of sites like this.